If you do not see one of these logos on the store you are shopping from, you may never receive your order, or will receive a counterfeit model. We have been receiving numerous complaints from disgruntled customers who mistakenly believe they purchased their rebounder directly from us only to discover that the merchant they placed an order with is either unresponsive, fake, or selling counterfeit models. 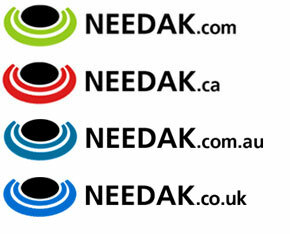 Please be wary when ordering a Needak Rebounder from any website other than Needak.com, Needak.ca (Needak Canada), and Needak.com.au (Needak Australia). Some of these unscrupulous sellers have taken to domains that look very similar to ours in order to confuse potential customers. Unfortunately, if you have already placed your order with one such merchant, there is little we can do. We recommend trying to contact them directly to resolve any issues and hope for resolution. Please note the following exceptions: needakrebounders.com and needak-rebounders.com are both websites for the manufacturing arm of Needak. If you have any questions in regards to this notice, let us know.